AMERICAN RELAPSE tells the story of two people fighting to make a difference against thedevastating heroin epidemic that's spawning a billion-dollar treatment industry. Against theodds, in an "Us vs. the World" mentality, two recovering addicts spend their lives pulling needlesout of the arms of addicts and assist in placing them in reputable treatment facilities. 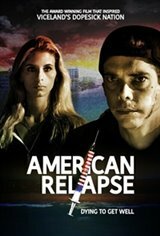 The filmfeatures Frankie and Allie who live and work in Delray Beach, Florida, the Rehab Capital ofAmerica, now referred to by some as the Relapse Capital of America. They allowed the filmcrew all access for one weekend. What transpires over 72 hours is not only captivating and raw,but a heartbreaking rollercoaster ride.